IMPORTANT: When creating an Inbound Store Transfer, you must be logged into the location that the product(s) will be transferred IN to !!! (1) Select the appropriate Store Transfer Out transaction # that you would like to receive into inventory. The Origin Transfer # drop-down list will only show Store Transfers that have been sent the location you are currently logged into. (2) Select the appropriate Bin for which you would like the product(s) to be placed in. (3) The Transferred from location will populate based on the Origin Transfer Number. (4) Enter the Qty (Quantity) of the product being transferred IN to inventory. You may change the quantity by either using the scrollbar on the right-hand side of the Qty field or by manually entering the desired quantity. You can determine how many products were transferred to you by holding your mouse stationary over the Qty field. It is recommended that you enter the quantity of products that you physically receive from the sending location. In the example above, only 3 of 5 ACCESSORY products were received from the sending location. You will be given the opportunity to leave this Store Transfer open and receive the remaining products at a later time. If 'Supply Serial Numbers and Quantities' was selected in the Store Transfer Preferences, TeleTracker Online will automatically populate the Store Transfer In with all of the Product Codes, Quantities, and Serial Numbers from the Origin Transfer #. If 'Supply Product Codes Only' was selected in the Store Transfer Preferences, TeleTracker Online will only automatically populate the Product Codes of the Origin Transfer #. Quantities and Serial Numbers will be entered by the receiving location based upon the physical inventory they receive from the sending location. 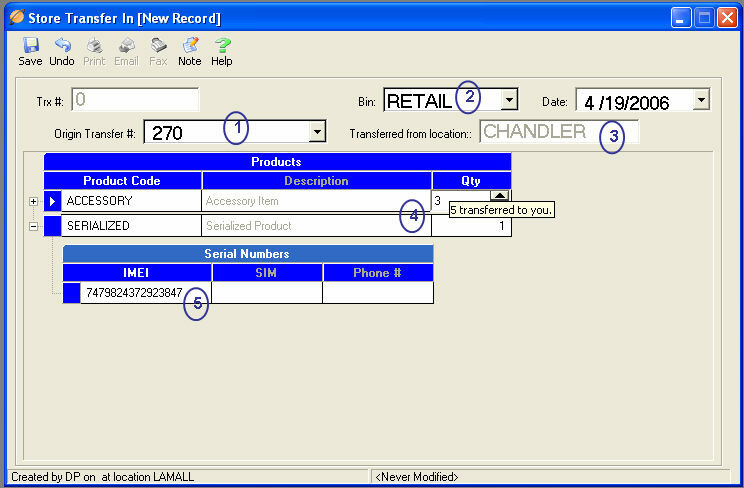 Serial Numbers entered by the receiving location must match the serial numbers sent by the sending location in order for the Store Transfer IN to be saved. You may enter serial numbers either by scanning them with a barcode scanner or by manually entering the values. Select Yes to save the Store Transfer IN and prevent additional products to be received at a later time. Select No to save the Store Transfer IN and have the ability to open the transaction and receive the remaining items. The Store Transfer IN will update with the remaining items to be received. Return to this Store Transfer IN to receive the remaining products by following the steps defined above.